Click photo to view Flickr Gallery. Ninety-eight percent of all Drake students receive financial aid. These scholarships are invaluable in terms of keeping the university affordable. Megan Kassmeier, AS’13, understands this first hand as she works for a company that does not compensate its employees for graduate degrees. Kassmeier, originally a music student, found herself on a different path after graduation when she fell in love with the nonprofit sector. In order to pursue her passion, she decided to get a graduate degree in Drake’s nonprofit concentration. The Judith A. Lindquist Scholarship, for women in the MBA program, immeasurably helped her meet this goal. While she is still working on her degree, she is already using the lessons taught in the classroom in her workplace. “As I complete my first year in the graduate program, I can honestly say that while classes have been challenging at times, I’m gaining knowledge that has tremendously helped me at my current job,” Kassmeier said. One week after learning about grant writing in class, Kassmeier’s work needed her to apply this exact skill, something she excelled at with her recent education. The generosity of donors doesn’t end with students, though. 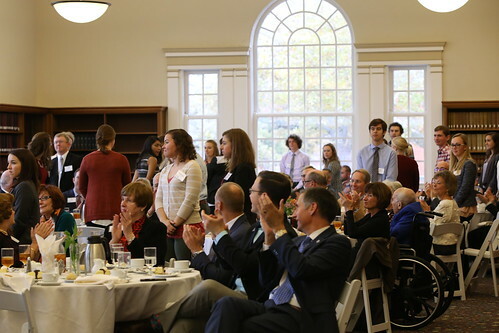 President Martin ended the luncheon with a brief outline of all the events going on at Drake that day, from a reception for veterans in the morning to the opening game of the women’s basketball team that night. “Nothing I just listed would be possible without the generosity and commitment our donors have to the institution,” he said.